Hi friends! 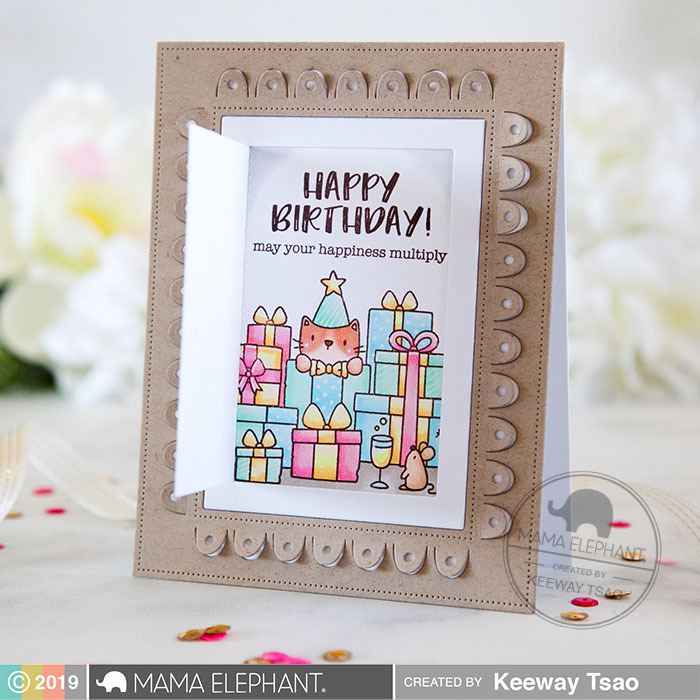 It's Keeway here today and I've up The Birthday Bash set with several other products to create a fun interactive surprise behind the door! 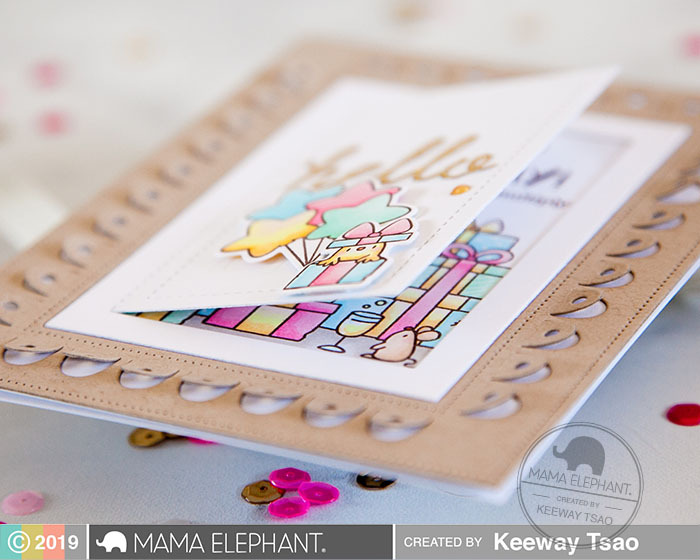 Let's start with the stamped images. I used the large pile of presents and the balloons from The Birthday Bash and an extra present with a chick from Trim the Tree. Only the balloons and chick were die cut out. For the pile of presents you'll only need to color a section of it and do not die cut this piece. Next, I took out the Fancy Door Frame Creative Cuts and die cut the frame out of kraft card stock and the door out of white card stock. 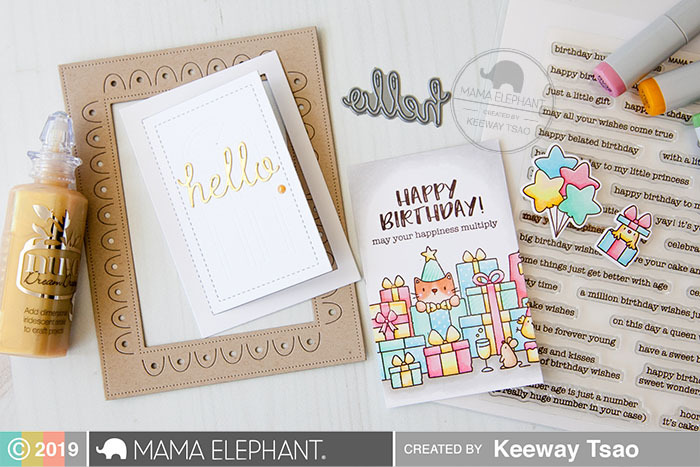 I used the small hello die cut from Venice Envelope Creative Cuts out of gold mirror card stock. The 'hello' was added to the front of the door. I wanted the birthday sentiment behind the door. 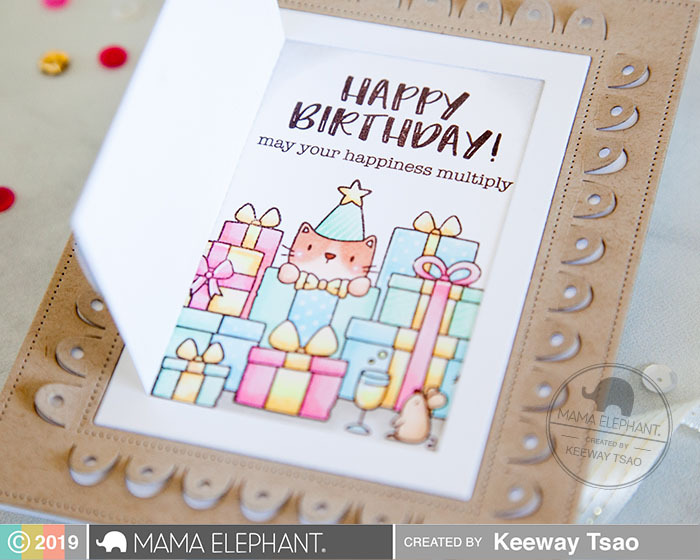 I used the 'happy birthday' from Garden Frame and the 'may your happiness multiply' from Birthday Messages, stamped above the pile of presents. For assembly, I adhered the image behind the door first. Then, I added the kraft frame to my card base, and inlaid the door in. Then, I added the birthday chick present and balloons to the front of the door with foam tape. And finally, added a single gold nuvo drop to the door handle. Give it a few minutes for the nuvo drop to dry and you're set! I gently flared up the little scallop edges in the frame for a little dimension. Isn't it such a cute little surprise inside? Hope you enjoy today's dose of inspiration and have a beautiful day!